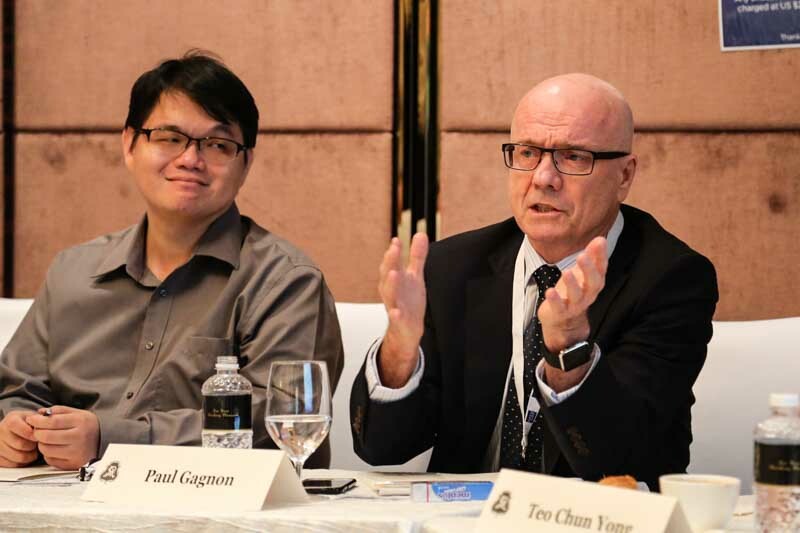 OpenGov sat down with Paul Gagnon, Director of E-Learning and IT Services at the recently formed Lee Kong Chian School of Medicine (LKCMedicine), a collaboration between Imperial College, London and Nanyang Technological University, Singapore. Can you tell us about the implementation of your E-Learning Framework? Well, TERASA is a theoretical framework that I coined based onthe reasoned application of technology enabled resources, activities, support and assessment, all properly aligned. In E-learning, you have to think about your activities, the way in which you will support these and more importantly, how you will monitor and record said assessments. In other words, wefirst have to know where we are going. Then decide how we are to get there…or then how we intend to use the tool – whatever that tool may be – to shape that journey. In our instance, we, my team and I, knew that we needed to design, develop, and deliver an innovative technology-enabled eLearning experience for our students. We have students travelling between Novena campus and the LKCMedicine Headquarters at Mandalay Road. Accordingly, we needed to think carefully about how a totally mobile, paperless experience would look; an experience which reflects seamlessly integratedtechnology into the classroomor curriculum experience. One very important aspect of this planned engagement with all associated learning resources is the extent to which the material meets the criteria of the 4Cs: Curiosity, Context, Challenge and Control. Can you please elaborate on the structure of the learning ecosystem? The University of Sydney developed a Problem-based learning (PBL) system. We converted it to Team-Based Learning (TBL). The Online Learning Ecosystem has four components, iLKC, iLAMs, iLecture and iFolio. iLecture is a virtual library, organised using the concept of library stacks. You walk in and you see stacks for Year 1, Year 2 and so on. All of the materials in iLecture are in iLKC, which is our Curriculum Management System. iLKC and iLecture both sit in an iPad app. We also created an open source based system called iLAMPs, which allows us to provide sequenced learning in the classroom. So, students prepare before they come to class. Then they open up the sequence on their iPads when they come to class. Then they are guided by the TBL process. We also have something called iFolio. iFolio supports workplace based assessment when they move into clinical years, working in a hospital. All these are not only available on their tablets, but are also accessible via the web. It’s a flipped classroom. The instruction and exercise elements are reversed. Video lectures are viewed by students before the class. During class, students work on exercises and projects. Now that the E-learning system has been implemented, what is the next step? I am working on an online cognitive tutor, building on IBM’s AI agent, Watson. The cognitive tutor would understand who we are as learners. It would provide a path and understanding of the overall framework of outcomes and competencies that we must achieve. It would track us, prompt us about what we have to prepare for, suggest materials, pro-actively manage cognitive decay (you learn something today and it starts to fade after a while). In maybe 7 days, the system can check your understanding of the concept. After a while, the Cognitive Tutor could provide other insights, such as students’ preference for material outside of what we are providing. We could provide that material, following an approval process to ensure that this unstructured curriculum is in fact aligned with our structured competency framework. Using Deep Learning, Watson will learn with the students and effectively enable us to support the students’ online learning journey. My vision is that it will support the learner, become the learner’s, if you will, personal learning companion, whoever he or she may be, as they move through their curriculum experience. It will support advanced, accelerated learning or slower remedial learning, as required. It will support active learning in the very real sense that student’s get to choose the what, when and how they learn the materials for which they are responsible for developing mastery. What is the timeline for the development of the cognitive tutor? We are close to an agreement after two years of discussion. We hope to have a working prototype within the next 2. We will move forward in an iterative manner. We are not just going to build this, ticking pre-decided boxes. To implement this, you will need a lot of data? Are there any challenges you face on that front? Yes. We have enormous amounts of data. We have tagged our learning resources according to the General Medical Council and Singapore Medical Council competency frameworks. That’s why IBM is working with us. In other words, this class has a set of outcomes that are aligned to a set of resources. With this information having been tagged we know what resources the learners have covered, how much time they have spent on it/them, how well they have done with their assessments, what workplace-based assessments they have completed, as well as, any clinical based examinations, including the integration of multi-source feedback. At the backend, we are working on a data warehouse, that will support Watson’s access go and ability to support student queries: in short Watson will know exactly, what to pull. That’s the structured data. There’s also unstructured data. This is the bigger challenge in that we have to align it with the structured data. For example, say as a teacher, I know that you have covered certain learning materials. However, when you speak to me, I realise that though you have met the outcome, covered the required resource, and passed all associated assessments, you are not expressing that! At this point, I need to spend some time with you, because I cannot pass you out into the profession….when there’s this dissonance that I am perceiving. In essence that is the grand challenge: to enable the cognitive tutor to use unstructured data to make those kinds of assessments. Are there any plans for collaboration and data sharing with other universities? We will start off with the Strategic Alliance for Innovation and Technology in Education, with the University of Sydney in Australia and the Karolinska Institutet in Sweden to form a closed open-source consortium. It might sound like an oxymoron but if people wanted to come on board and help us develop the various aspects of the system, then that would be great. Wemay possibly work with IBM, all things going well, to create a commercial product. However, the goal is to ensure that whatever we develop, it is extensible to the general learning community, not just the medical community. What is your long-term vision for the role of such a cognitive tutor in education? The long-term vision of this, is that it starts with you as a student studying to be a doctor. It moves with you, as you progress through the medical training program, residency and ends up on your desktop in your clinic. For instance, when you are a practicing physician and are seated with a patient, your personal learning companion (PLC) aka the Cognitive Tutor is still with you. It is like your learning companion learning with you, failing with you, if you will. It knows very well what you know. It scours multitudes of databases, providing the latest research information, helping you to make diagnoses and decide on courses of action. Going even further, and thinking about the general educational learning experience, at age 6 you could have a cognitive tutor with you. It knows what you are learning and it supports you in growing at your own pace, in your own time, in the context of the socio-cultural environment you happen to have been born into. For instance, I am from Canada and you are from India. At a later stage, Watson might help us align based on our commonalities. We might have the propensity to learn the same thing and do well at it. Then Watson might direct us to meet, because working together we might discover something new that might help change this world.